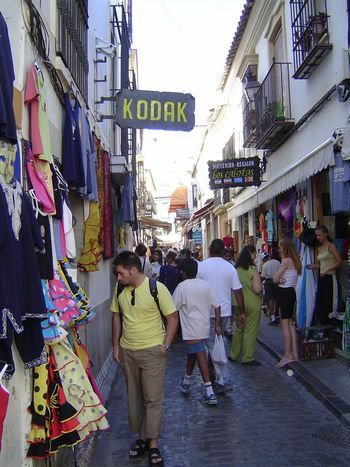 As "Corduba," Cordoba was the capital of the Roman province of Baetica; it was the place where both Seneca and Lucan were born and where both, on Nero's orders, committed suicide. Baetica was Christianized in the third century and in the fifth was conquered by Vandals, and it is from them that the name Andalucia comes as Vandalusia, "the land of the Vandals." The Muslim army, led by the Berber general Tarik-ibn-Zeyad arrived in 711. (Gibraltar is named for their general: Jebel al-Tarik or the Mountain of Tarik.) His army, composed mostly of Berbers, fought and conquered almost all of Spain in the name of the Ummayad caliph in Damascus. In 750, however, the caliph Marwan II, along with his family, was slaughtered by the founders of the Abbasid dynasty. Only one of the Ummayads escaped, the young Abdel Rahman I. He fled to al-Andalus, as far as possible from the threatening Abbasids. There he took charge of al-Andalous and in 756 declared it an emirate, a province of the caliphate. Functionally, however, it was independent of Baghdad. Such was its ambiguous status for almost 300 years, until Abdel Rahman III took advantage of Abbasid weakness--this was the time of the schism that produced the Shiites--and elevated himself to the position of caliph, successor to the Prophet. The Caliphate of Cordoba lasted about a century, during which it continued to control lands as far north as Toledo and Zaragoza. A Berber revolt shortly after 1,000, however, destroyed the caliphate, and in its place arose a mosaic of independent kingdoms, the taifa or "faction" kingdoms). 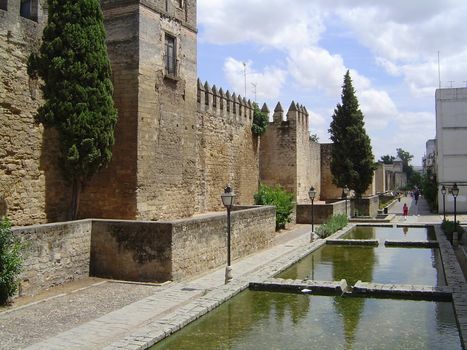 They in turn were replaced by the Berber Almohads, who transferred the capital of al-Andalus from Cordoba to Seville. Shortly thereafter, in 1236, Cordoba was lost to the Muslims during the Reconquest. 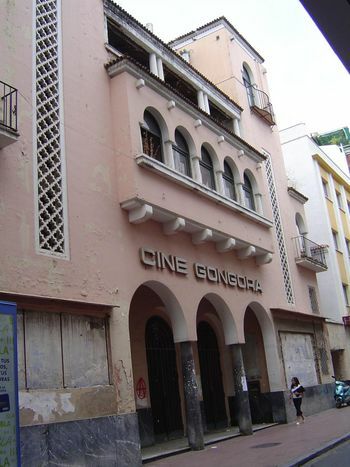 Al-Makkari, who shortly after 1600 compiled a history of Andalucia, set out to describe "Cordova,--the seat of a mighty empire which subdued all its enemies." 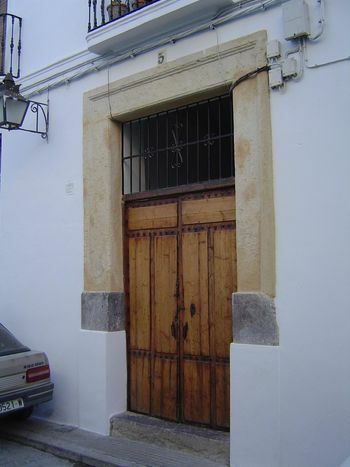 He describes "its [once] blessed mosque, built by the Beni Umeyyah, filled with all sorts of rarities, and ornamented with dazzling magnificence... " Two hundred years later, however, in the 1830s, Richard Ford visited Cordoba and shook his head in disbelief. 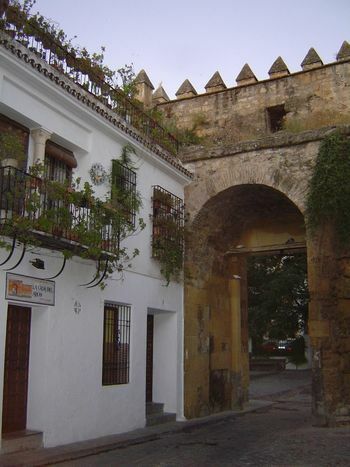 Cordoba, he wrote, "contained in the tenth century nearly a million inhabitants, 300 mosques, 900 baths, and 600 inns. It withered under the Spaniard; and is now a dirty, benighted, ill-provided, decaying place...." For visitors, he continued, "a day will suffice for everything..."
It's not that bad now, not by a long shot. 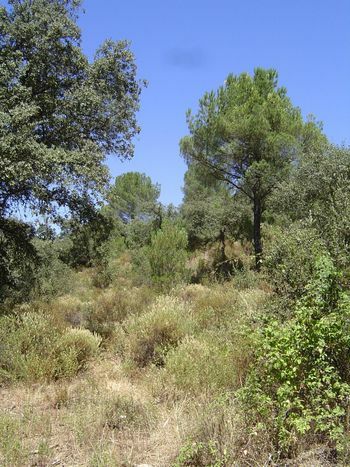 Fifteen miles from the city: pines, oak, and chaparral cover the Sierra de Cordoba, foothills of the Sierra Morena. 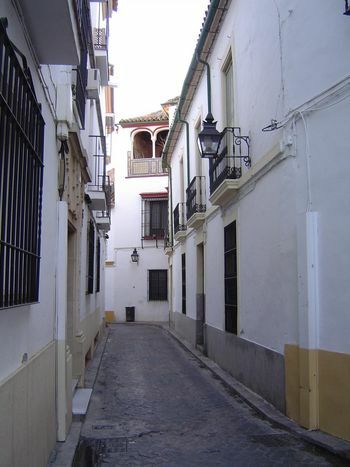 Cordoba lies downhill, in the valley of the Guadalquivir, just south of these hills. 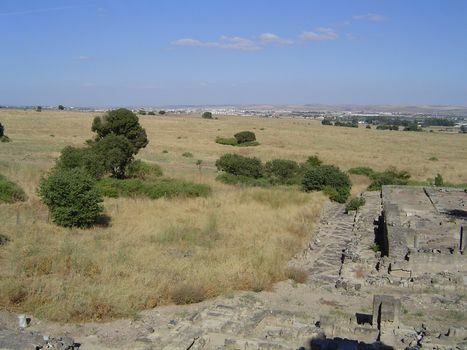 The plains of the Guadalquivir, with Cordoba in the distance and the ruins of the mosque of Medina Azahara in the right foreground. The intervening ground a thousand years ago was closely cultivated: Al-Makkari quotes an unnamed author, for example, who says that "numerous springs and winding brooks irrigate and fertilize the neighboring fields and farms, which in point of extent, careful cultivation, and abundant produce, have nowhere their equal in the world." 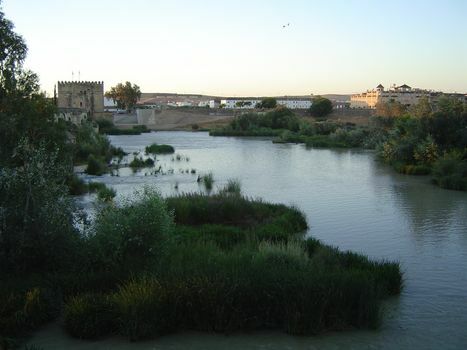 The name Guadalquivir is a corruption of the Arabic wadi al kebir, "big river." It's not so big now, because upstream dams and irrigation diversions have reduced its flow. 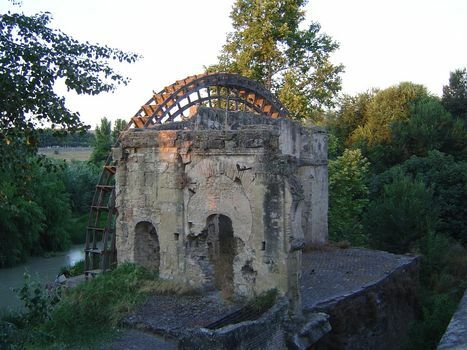 A waterwheel survives just outside the city wall. Al-Makkari quotes ash-Shakandi, who wrote before his death in 1231 of "the innumerable mills which the river puts in motion, and which are estimated at no less than five thousand." It's a factual statement that fills Al-Makkari with longing. His work, translated into English in 1840 with the ponderous title The History of the Mohammedan Dynasties in Spain (reprinted 2002), is known in Arabic as Nafh al-tib or "Sweet Scent." The literal translation of its title is Sweet Scent from the Tender Bough of al-Andalus." 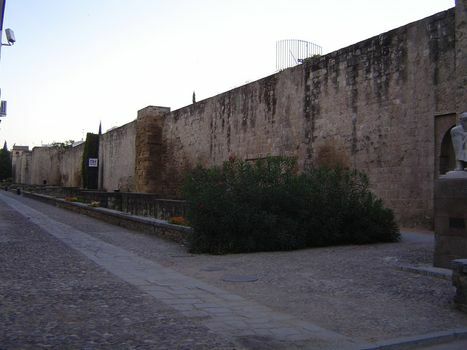 The Romans walled the city, but the surviving wall--only fragments remain--dates from Islamic times. A surviving gate--the Puerta del Almodovar--seen from inside the Juderia, the old Jewish quarter. This is probably the gate of which al-Makkari writes: "There was still another gate, formerly called Babu-l-yahud (the gate of the Jews), but good Moslems having objected to the name, it was named Babu-l-hodi (The gate of direction)." 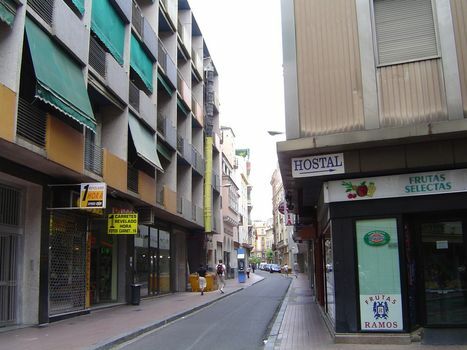 A typical street within the Juderia. An odd doorway ornament, but really not so odd: the inverted "U" is modelled on the similar but far grander alfiz that surrounds the mihrab or prayer niche in the nearby mesquita or mosque. 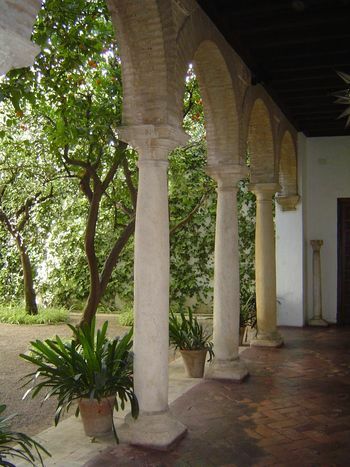 Courtyards are an archetypal element of Andalusia's homes, traceable to the Roman villas that were once here. 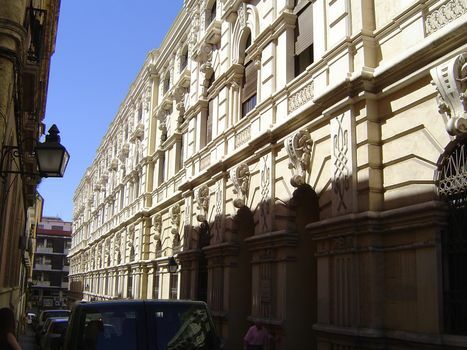 This is the reception courtyard in the Palacio de Viana, now a museum. 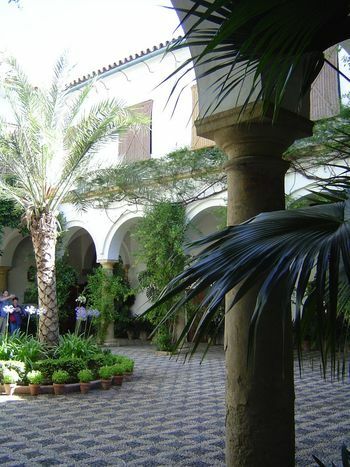 Another of the Viana palace's 14 courtyards: the chapel courtyard. 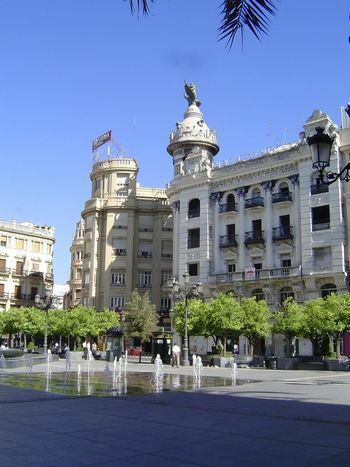 The Plaza de las Tendillas is within the line of the old walls but was entirely rebuilt to 19th century ideas of urbanity. Nearby, the massive bulk of a high school. Modern efforts to echo the city's past. 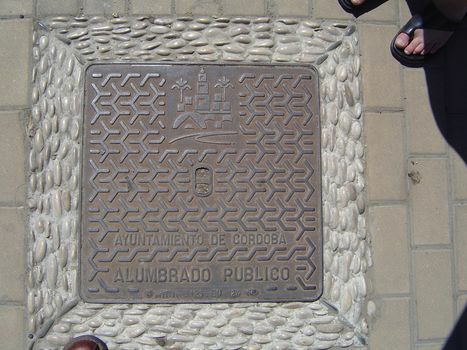 The city's manhole covers echo that heritage, too. Here's another approach to heritage: forget about it. 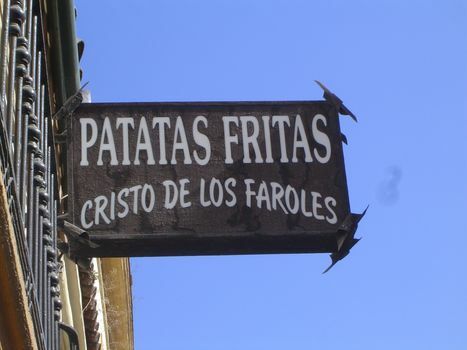 "Christ of the Lanterns" potato chips, made on the spot and named for an image of Christ in the nearby Capuchin plaza. Think there are tourists nearby? 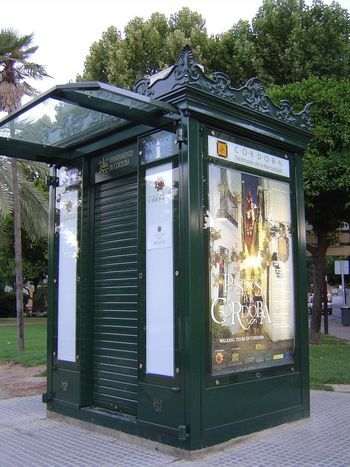 Think no more: a kiosk announces that Cordoba is part of the "Patrimonio de la Humanidad."